When my daughter Erin, and I were planning our 99-day adventure around the world, we built in some buffer time, between our scheduled times with our subjects. We needed flexibility, in the event things didn’t go perfectly according to plan, which had a high probability, considering the scope of our trip. Ultimately we had very few glitches and that buffer time gave us the opportunity to get more involved with the culture we were. It also gave us time to shoot still images. We spent 5 days in Moscow. It was June and the days were long. One Saturday, everywhere we went, there were weddings. It was amazing because each bride and groom seemed to have his or her own style – everything from a pirate theme to pure “glam”. Click here to see other still images from our journey. 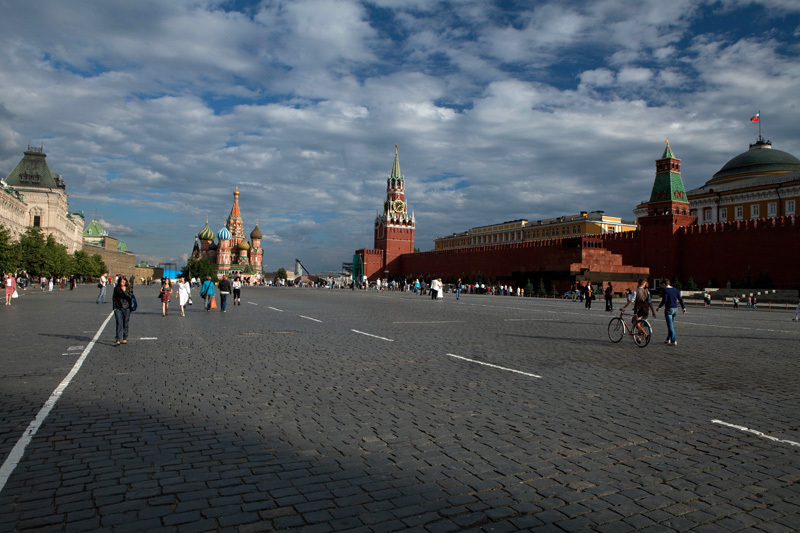 I must say my first impressions of Moscow were not great. The city was overwhelming with hordes of grim people riding the metro, intimidating Soviet officials and hard to navigate streets. But after only four days here, I have been totally drawn in and want to know and experience more. The culture is deep and vast and it’s impossible to even begin to understand its depth in such a short period of time. I know that I must return to dig deeper into the people and the city that lies beneath the surface. from diverse eras. So much to absorb in such a short period of time but such as it is when circling the globe in a mere three month time period. Seeing Lenin was an experience I will never forget. After waiting in a long line, we arrived at the security checkpoint and were instructed in not so pleasant terms to get into another long line and check in our cameras and cell phones. After fighting through the hordes of other tourists we were allowed into the mausoleum. It was dark and quiet. Outside of the hushed footsteps of people walking around Lenin’s preserved body, the only sounds I heard were the cry of a baby and the loud Shhh from the Soviet guards. It was almost hard to comprehend but yet memorable. 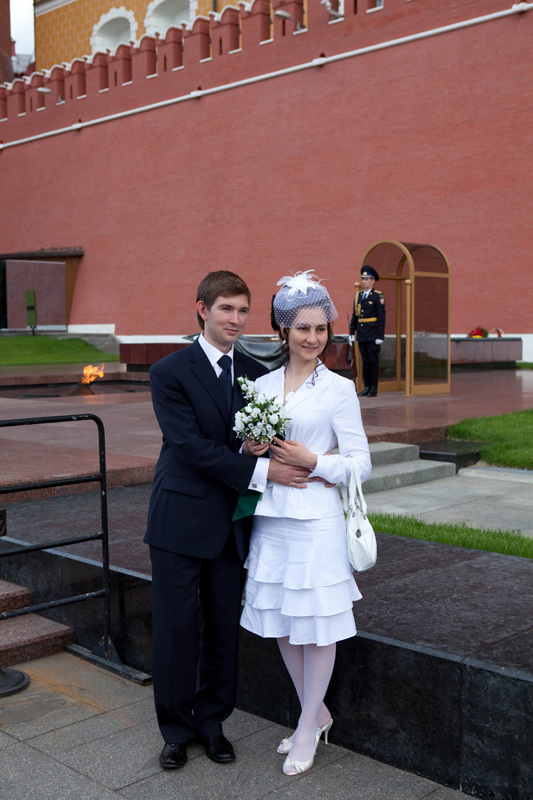 with its long days and the “white nights” it’s a popular time to get married and we saw wedding parties everywhere. Stylish bride and groom posing. have a style all their own and they show their flare in many ways, especially when posing for photos. They don’t just stand there and smile at the camera – they “pose”. It was quite a joy to see and made me wonder even more about the character of these people. One thing a bit bewildering was all the open drinking in public. An odd sight and a contrast to what you’d expect in a society that is seemingly structured and authoritarian. There is a definite sense of chaos amongst the bureaucracy and a laissez fare attitude. Not what I expected at all and a bit like the “Wild West”. It’s observations like this that make me want to understand more about this culture. 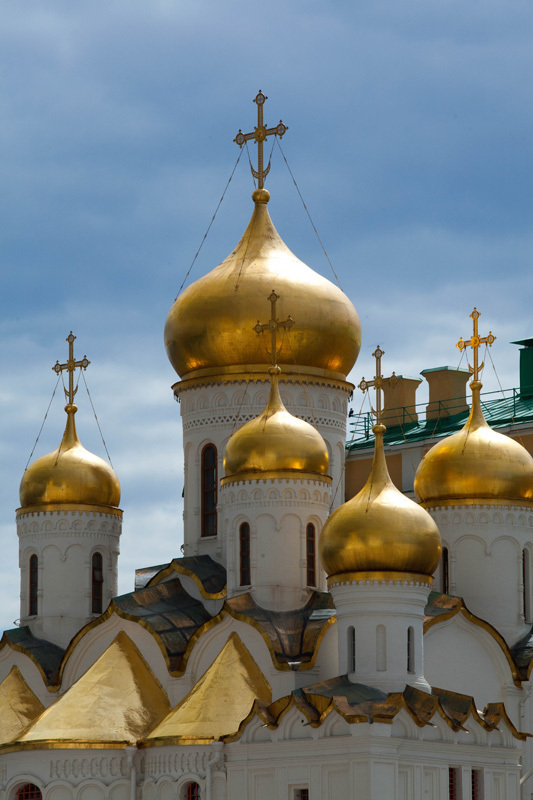 golden domes of the churches, been surrounded by women in babushkas as we entered the Cathedral of Chris the Savior, the “Mecca” of the Eastern Orthodox religion, were at arm’s length from the embalmed body of Lenin and drank beer with the locals at cafes. Our days have been long – the sun is up at 4AM and down at 11PM and we are pleasantly exhausted. My impressions of this great city have changed for the better since we’ve arrived. I’m no longer overwhelmed but invigorated and I will have to return to see more of Moscow and the rest of this vast country. One of the first things we noticed after arriving in Moscow was the poor quality of services for pedestrians. Sidewalks are bumpy with very high curbs, there are no elevators in the metro stations, and if you’re lucky enough to find a ramp, it’s extremely narrow, steep and slippery (we could barely roll our luggage up the one at the high-end Hilton Hotel). These are the kinds of obstacles that Yulia Simonova and other disabled people face everyday in Moscow and Russia in general. Yulia is the Project Coordinator for the Regional Society of Disabled People – Perspektiva, an organization that works to improve the conditions and raise awareness about the rights of disabled people in Russia. The conditions for disabled people in Russia are terrible – not many handicap-accesible areas, hardly any programs for the blind and deaf, few schools that accept disabled kids, etc. 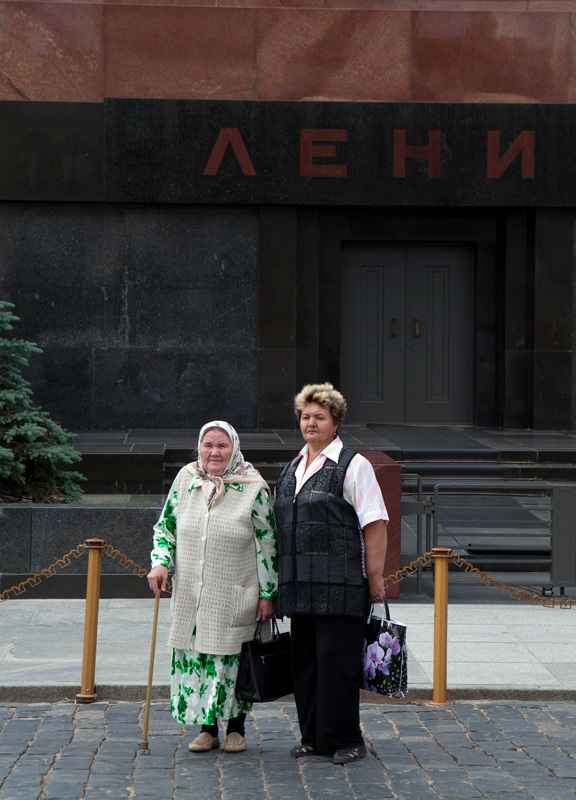 The mentality among the Russian people focuses on the masses, not on the individual. There are so many people in the country (10 million in Moscow alone) that problems affecting even a few thousand people don’t matter. Disabled people are invisible and the government can’t be bothered with implementing services for such a small group in the scheme of things. Yulia broke her back after a tragic gymnastics accident at the age of ten, and has been in a wheelchair ever since. She was forced to be home-schooled because the schools were not handicap-accessible at that time, and she began to lose hope in ever being able to lead a normal, happy life. She gradually met other people in wheelchairs and learned that they do in fact lead very diverse and active lives, changing her perspective on the possibilities for disabled people. After finishing school, she became a trained activist for people with disabilities through Perspektiva, and has been working for the organization ever since. Yulia works on the development of inclusive education, traveling to schools and training students, parents and administrators about people with disabilities. She meets with many children, both with and without disabilities, talking to them about all of the activities that she does and showing them how disabled people can, in fact, lead normal lives. The impact of such education is obvious – she recalled how one boy, who was not disabled, came up to her afterwards and said that he now wants to be friends with disabled kids and help them. Many parents become involved in creating awareness as well. And though progress is slow, it is there – there are now 80 inclusive schools in Moscow, which accept disabled children. Yulia’s story and Perspektiva’s mission are perfect examples of what creating awareness can accomplish. And that is the main goal of our project as well – to create awareness about individuals who are fighting for their beliefs, following their passions and making progress, one day at a time.